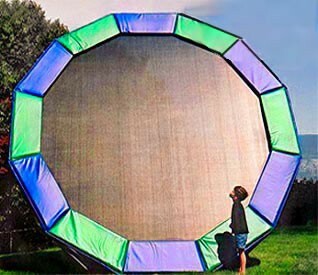 The 12-sided shape is for the most part an expensive round trampoline. It performs almost identically to our 14' round trampolines. Rather than this shape, we would normally recommend that you choose one of our best quality rectangular trampolines or one of our less expensive, same quality, round trampolines at $1095. SPRINGS: (100-8.5" long) Absolutely the best in the industry! These high performance , heavy duty, galvanized steel springs will last for many, many years.